Here at Marketing Edinburgh, we are cheerleaders of the city, and with a mountain of accolades, including recently being voted the ‘best place to live and work’ in the UK in a survey commissioned by Royal Mail, ­championing the Capital is one of the easier tasks that we undertake. Edinburgh is a truly international hub, with a reputation as a beautiful city, renowned for innovation, cultural creativity, technology, education and business. The prestigious JJL property investment index recently placed it in a global top five for investment, which, they suggest, is a benchmark of the city’s overall health. Other bellwethers include the recent announcement from Edinburgh Airport that Hainan Airlines will now run a direct flight from Edinburgh to Beijing, linking the city directly with China – a major importer of Scottish goods and services, giving Scotland’s businesses a direct link into this important ­market; and Virgin Hotels’ announcement that they’ll open their first European hotel here, each endorsements that offer great value in promoting the city’s unique offering internationally. There’s a sense of civic pride in Edinburgh from its residents which is ­tangible (and easy to understand). It’s a beautiful, safe, multicultural and welcoming city. For Edinburgh to continue to thrive as a vibrant city for residents and visitors alike, it will keep being bold and ambitious in its outlook, visionary in its ambitions for the future, welcoming to international visitors and attractive to global businesses. There’s a virtuous circle of continued success in Edinburgh; it starts with all of us as residents and our ­passion for our home; we create and contribute to innovative and welcoming businesses, cultural experiences, and strong communities, which ­combine to create a great place to live. In turn, Edinburgh’s international reputation grows, attracts more visitors, and international investment follows. Marketing Edinburgh works with stakeholders in all sectors of the city, to promote Edinburgh as an inspiring place to live, work, study, visit, invest and do business. At the nexus of everything we do is collaboration, we work to inspire and facilitate partnerships that support our shared objectives to position Edinburgh as a first- class destination in every dimension. Our business tourism team Convention Edinburgh have been working with VisitScotland to align our existing campaign, Make It Edinburgh, to their Project Legend campaign that highlights Scotland’s most innovative and renowned business sectors by focusing on some specific growth sectors; technology, creative industries and education. Edinburgh’s technology sector is a huge growth market, and recent notable success stories include software firmFree Agent; TV Squared who continue to impress with their advertising optimisation business; and, of course, SkyScanner. ­Edinburgh’s global reputation in technology is so established that the city now hosts the annual Turing ­Festival – billed as the best tech conference in the UK, and attracting international speakers and delegates. A city of culture celebrated for its architecture, galleries, and world renowned for its festivals, the Edinburgh annual summer festivals have a combined audience of 4.5 million people, numbers that mean it’s the biggest annual event in the world. Creativity is woven into our DNA, so much so that later this summer, we once again welcome hundreds of international policymakers, practitioners and delegates to the Edinburgh International Culture Summit. The theme of the 2018 summit, ­Culture: Connecting Peoples and Places, is ­relevant to the work that we do to promote Edinburgh’s internationalism. Our team at Film Edinburgh, who support a huge part of the city’s ­cultural sector, worked with the ­producers of what will become one of this summer’s biggest global blockbusters, Avengers: Infinity War. ­During seven weeks of filming last year, Edinburgh was the only location used, demonstrating that the city has the infrastructure and process in place to accommodate and ­welcome big budget productions, and in part contributing to Film Edinburgh’s most successful year ever with an impact of £16.1million. Excited film fans from Edinburgh now wait eagerly to see their home on the big screen, when the movie is released at the end of the month. We’re working with partners across the city to encourage fans to come to Edinburgh The City of Superheroes to see the film over its opening weekend, with themed events happening city wide 27-29 April. The student market presents another international platform and opportunity for the city; international ­students generate £25billion to the UK economy. Marketing Edinburgh works with all four of the city’s world class universities to promote Edinburgh as a great place to study. We launched a campaign in partnership with each of the universities internationally, following a string of accolades for the city, including its rising rankings in the QS World’s Best Student Cities Index. It’s been voted the best UK city for three years in a row by The Telegraph and is also known as the world’s third safest city. Now Edinburgh is known as one of the happiest places in the UK and was identified as the greenest city in the British Isles, with almost half of the city green space. With tourism recognised as an important part of the local economy, supporting 34,800 jobs and generating £1.46billion in visitor spend, it’s promising to see that leisure, academic, and business tourists are increasingly attracted to our city. We’ll continue to put resources into supporting these sectors to promote them internationally, as their success supports the overall success of Edinburgh. 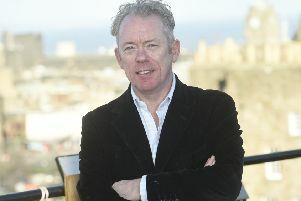 John Donnelly, chief executive, ­Marketing Edinburgh.